Our client needed an enthusiastic demonstrator to assist his exhibition at the Good Food Show. The demonstrator needed to be a keen baker. The role was making fresh bread using Lékué's new microwaveable 100% platinum silicone bread maker. 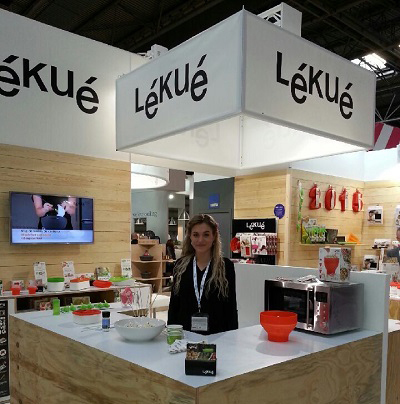 Lékué are a worldwide leader in innovative silicone cooking and baking products for healthy food preparation and storage. They also make innovative cookware utensils for the modern day user. The client needed the sampling staff member to be passionate about cooking/baking and also someone who represented their modern, trendy high class brand. Toni's bright and bubbly personality earned her favour amongst surrounding exhibitors and visitors alike, she was the perfect candidate for the Lukue brand. Toni engaged with visitors by demonstrating how the bread maker works and offering samples of freshly made bread. She quickly becomed accustomed with the popcorn maked and chocolate fondue maker. Toni had great fun working on this role and this showed in her performance. Leah, Head of Promotions visited Toni during the exhibition and noted how well Toni and the client got along. It's important during a tough exhibiton that the client has someone they like and can rely on. Especially when they're the only 2 on the stand. The client needs to be comfortable that during a break he/she can leave the stand in good hands. I believe it was evident that the client had found this in Toni.